Try Brazil’s finest without even having to leave Melbourne! 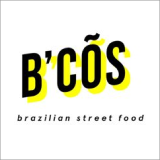 B’cos Brazil offers a large variety of Brazilian specialities right on Little Collins Street! Open Mondays to Fridays, taste all the Brazil has to offer. Try a coxinha, crunchy dough with a cream cheese and chicken filling, or a Picanha, a Brazilian steak! Don’t miss the brigadeiro, a ball of chocolate heaven, for dessert! If you do not already love Brazilian food, you will after B’cos Brazil. Whether it be rice, beans, veggies, or meat, B’cos Brazil perfects it all! A small little cafe, the venue itself is absolutely charming. You can’t miss the beautiful sky blue chairs outside the patio, perfect to enjoy your meal on a warm day. The colour doesn’t stop outside either! Inside, the bar is decorated with yellows, oranges, blacks, and whites to create beautiful patterns. Hints of bright blue and chalkboard menus make the restaurant a fun place to grab your next meal! Located in the heart of Melbourne, B’cos Brazil is a must!